President Donald Trump and 20 other world leaders were in Argentina over the weekend. On Friday, Trump signed a new North American trade agreement with Mexico and Canada, replacing the Clinton-implemented North American Free Trade Agreement. 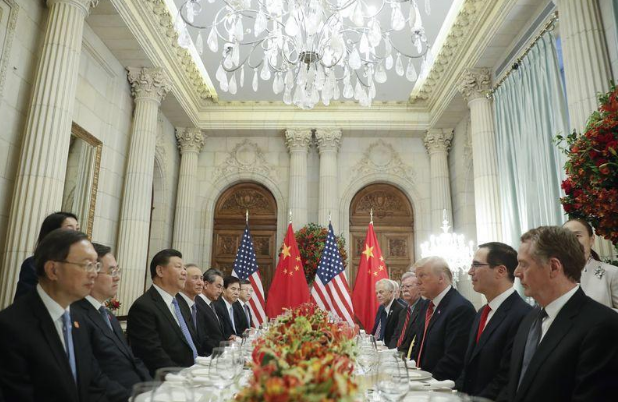 While a notable win for the Donald, the more important news that surfaced from the G20 summit was another agreed to trade deal with the U.S. and China. Chinese President Xi Jingping and President Trump put their debilitating trade war on hold, striking a deal to hold off on adding new tariffs on each other’s goods starting in January to give the two sides more time to reconcile their many differences on trade. China has reportedly agreed to purchase a yet to be agreed upon amount of agricultural, energy, industrial, and other products from the U.S. in an effort to reduce the trade deficit between the two countries. The Trump administration has already started tariffs on $250 billion worth of Chinese imports while Xi’s government has leveled tariffs on $110 billion in U.S. goods. This trade deal was struck while our trade deficit with China rose faster than it has in three years. The U.S. trade deficit widened in July by the most in three years as the gap with China hit a record. The deficit increased 9.5 percent to $50.1 billion, according to the Commerce Department. The impact of tariffs, while necessary to bring China to the negotiating table, will continue to weigh on Trump’s ‘America First’ economy in the final quarter of 2018. Third parties seemed encouraged by the deal too. Technology trade body ITI said the agreement was “a critical step toward de-escalating the mutually damaging trade war between the world’s two largest economies. Those in finance, however, were cautiously optimistic. Paul Ashworth of Capital Economists believes Trump cannot always be kept to agreements, referring to a previous deal Trump backed out on with the Chinese. “We suspect that since he negotiated this deal himself, Trump will be much more reluctant to torpedo it when his own personal reputation is on the line,” Ashworth stated. A rising China has to be dealt with economically. All of these trade tensions are going on in the background of not only a rising China on the world’s economic stage, but also a growing Chinese military looking to expand beyond its borders. The Trump administration and future administrations must do everything they can do avoid a devastating war with China, which would also likely include Russia. With the way things are going in the South China Sea and on trade, we appear to be entering a new Cold War with our counterpart across the Pacific Ocean. War with China in the Pacific appears unavoidable. Throughout the world’s history, a top economic power and the rising economic force competing with that top power inevitably go to war for supremacy. Human nature remains the same and China’s ambitions to become the top dog on the world’s stage have been well documented in recent years. Amazingly, the media appears to barely focus on this increasingly important global issue. The U.S. military is dead set on deterring aggression in the Indo-Pacific region as China builds islands with military bases in the South China Sea and looks to expand its military bases in the region. China has been rumored to be looking to build a military base on Vanuatu, near Australia, and is also funding the redevelopment of a port in Samoa. China also managed sign a deal to build a multi-million dollar port in the strategic country of Myanmar, in the Bay of Bengal wedged between India and Thailand. While China has been ramping up its military capabilities, it is important to keep things in perspective. The U.S. has more than 1,000 military bases worldwide while China only has one in Djibouti. Though the Chinese are looking to expand their bases and project its might in the South Pacific, they still pale in comparison to what the U.S. military has around the world. It’s also worth noting that the Chinese have only two aircraft carriers and recently announced that it is building its third. To counter China’s moves in the region, the U.S. and Australia are looking to build a joint naval base with Australia on Papua New Guinea’s Manus Island. The military industrial complex is still keeping the fear factor going against our Chinese adversaries. According to a recent report by the National Defense Strategy Commission, China is on track to acquire peer military status with the U.S. by 2050. Neoconservative and rabid interventionist Bill Kristol of the Weekly Standard, tweeted on November 23rd, “Shouldn’t an important US foreign policy goal of the next couple of decades be regime chance in China?” Well, Mr. Kristol, how did regime change go in Syria, Iraq, Libya, Afghanistan, and Iran? Problem is, the U.S. will not recognize that reality. Which means, a hot war is coming after the cold war ends and the trade war destroys our economies. When that will occur is anyone’s guess. But to me, it appears inevitable. Unfortunately, I fear it will happen within my lifetime. Let’s step away from the next world war and finish with trade talks today. Does the trade deal in Argentina amount to anything? Did it accomplish anything significant? Or does it merely delay the inevitable ratcheting up of the tariffs? The arrangement provides time for both leaders to make more progress on the great divide between the world’s two largest economies. Despite a long discussion over dinner, all they could agree upon was a pause in the tariffs. No progress appears to have been made on the core issues at the root of all of this. All this will do will provide a temporary Christmas rally through the end of the year for two governments that have struggled with some troubling economic news in the last few months. The two contrasting worldviews from two completely different cultures make a lasting solution to this trade issue impossible to achieve unless either Trump or Xi backs down. And right now, neither appears willing to do so. Get ready for more tariffs next year! Stock market got wrong message from Jerome Powell’s speech – Business Insider ABSOLUTE must read.